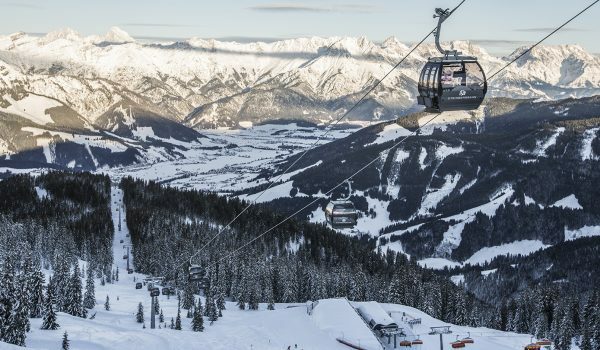 LIFTS: 10 (Gondola-2 / Chair lift-4 / Drag lifts-4) 70 lifts over Saalbach area. 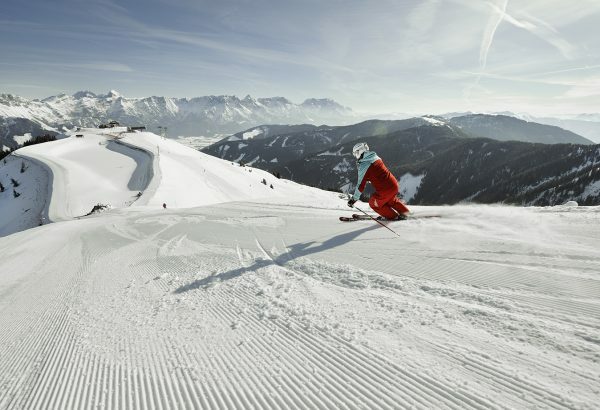 SLOPES: 17 Pistes in Leogang, 118 pistes with Saalbach totalling 270km. 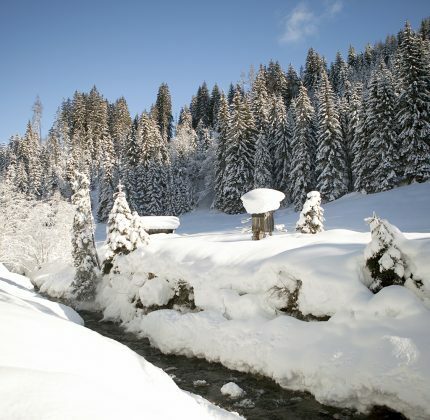 SNOWMAKING: 90% of pistes in the Saalbach area have snow cannons. 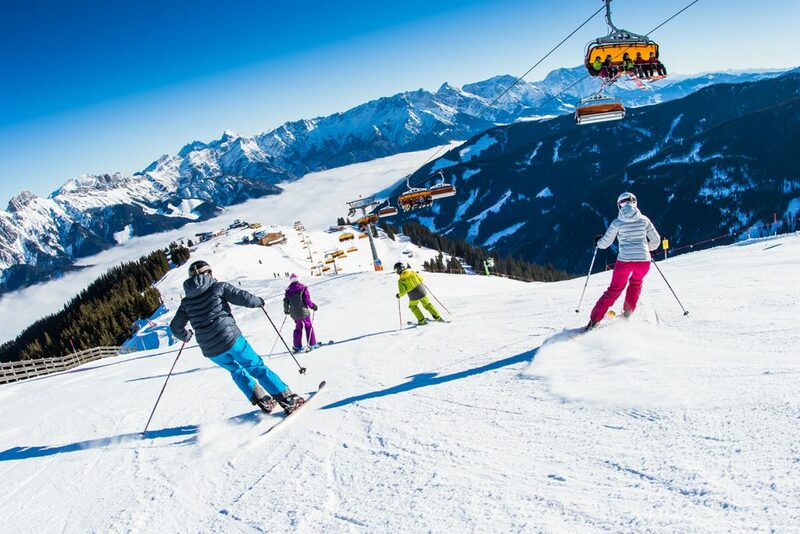 SKI FACTS: Leogang is part of the vast skiing area ‘Saalbach Hinterglemm Leogang Fieberbrunn’ which covers 140 km blue, 112 km red and 18 km of black slopes and 60 cosy 60 cosy ski huts. 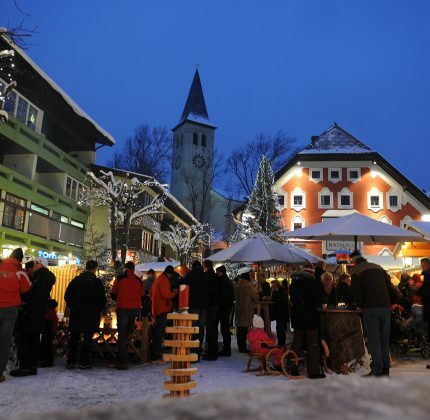 A traditional mountains settlement, Leogang delivers the cosy, pretty and picturesque Alpine village feel but with very modern facilities and great connections into the Saalbach Hinterglemm ski area. It has a mix of old and new buildings that work well together. The area tends to be a little cheaper than its larger neighbours, which is always a bonus. 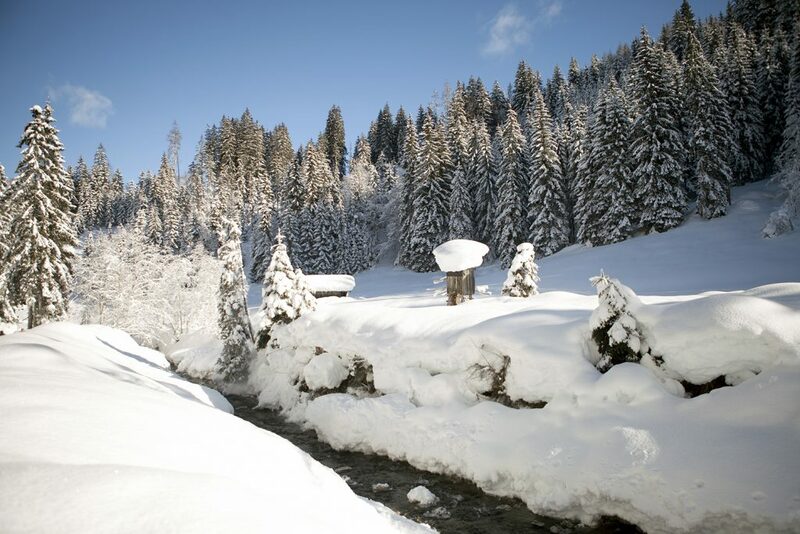 If staying in Leogang we recommend staying at the beautifully designed Forsthofalm Holtz Hotel for ski in/ski out access and phenomenal food. The motto of the whole area is ‘Home of Lassig’ which translates as home of casual, which totally suits the vibe here. The Skiing of Leogang is fabulous. 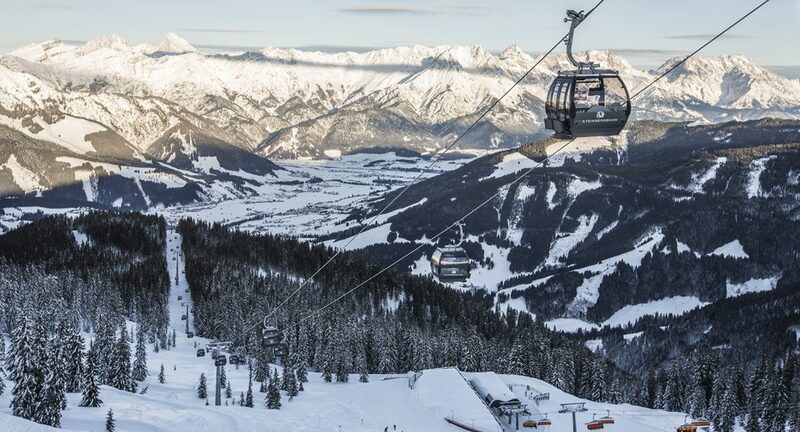 Directly linked via super modern lifts to the huge Saalbach Hinterglemm Ski which covers 270km, making it one of the larger ski areas of Austria. 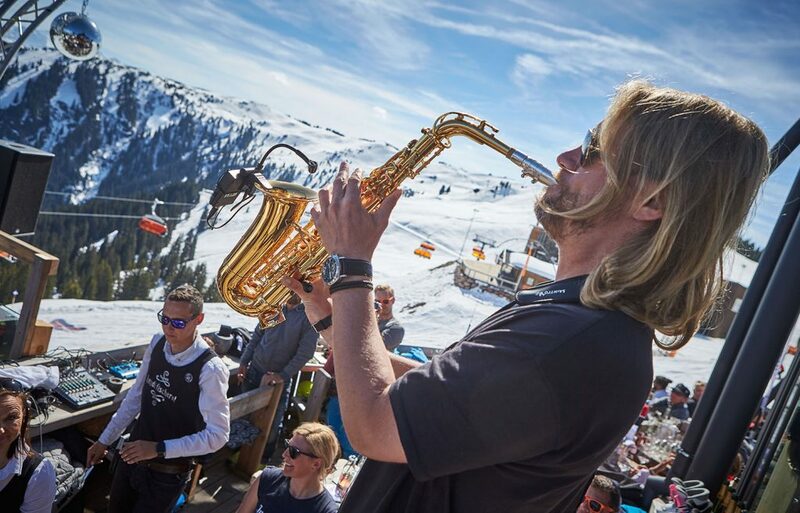 There is skiing to suit all standard of skiers & boarders. The surrounding mountains are stunning with the Pingauer mountains and the Kitzbühler alps and the area tends to have a great snow record considering its altitude. It only take 12 minutes to get from Leogang to the top of the mountain due to the rather fast 8 person gondola. Because Leogang is at one end of the Saalbach Hinterglemm ski circus it tends to have less traffic, making for quieter pistes. There are several mountain huts to eat, drink and be merry in. 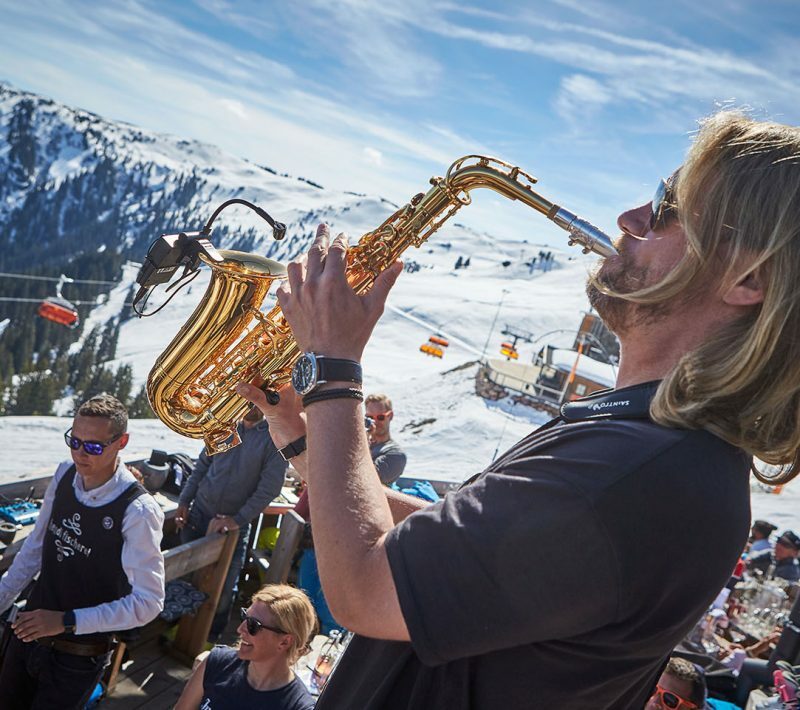 We had a fabulous time during the White Pearl Mountain Days celebrations at the Hendl Fischerei with DJ, live musicians, hearty mountain food, lots of Champagne and an altogether awesome vibe. The modern architecture is also pretty cool, with stunning views from almost everywhere you sit. For something a little more traditional there is the Alte Schmiede with its vast timber building, the interiors are that of classic Alpine antiquity and the verandas are vast. The restaurant serves a multitude of classic Austrian dishes, you will certainly not be disappointed. Leogang has a small selection of excellent nursery slopes. About 90% of the ski area is suited to intermediate skiers, so consider the whole mountain as your playground. Despite most of the Leogang being relatively easy to ski for advanced skiers there is still a lot of fun to be had. 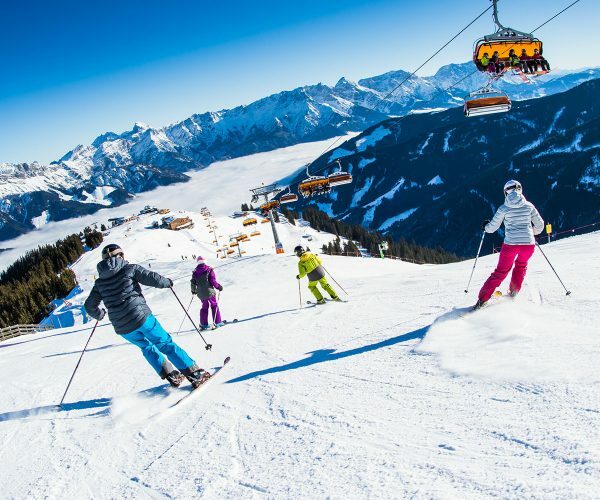 The main black slope is near the bottom of the valley, otherwise head over to the Saalbach Hinterglemm side of the mountain to the black pistes of the Schattberg and Zwolferkogel. The Saalbach Hinterglemm provides some great Freeride access from special routes that are signposted to pistes that have been left unprepared. There appears to be something for all levels of off piste skiers from those making their first tacks into the off piste to the advanced powder heros! Check out the local Freeride section of the Saalbach website for more information. Do not forget to take a mountain guide with you to find the best snow and keep safe. Leogang has some great pistes and some of them remind me of pistes in the USA, especially some of the treeline pistes. I particularly liked the very long slope 92/93 back down to Leogang. The final descent, piste 90 back to the Forsthofalm Hotel was always a fun way to end the day followed by a cocktail on the veranda. 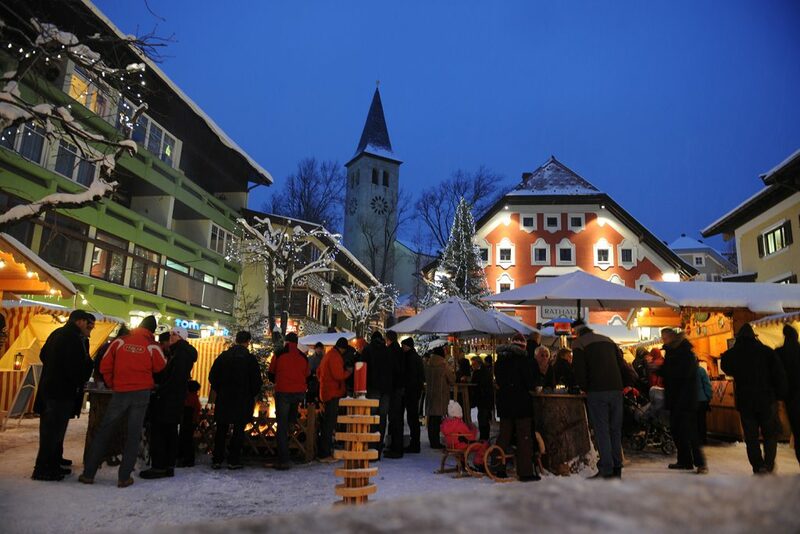 Of course it is worth skiing over to Saalbach to discover the treats that await you there as well.